Mark Boslough and Dave Crawford of Sandia National Laboratories predicted the Hubble telescope could see a rising plume as comet Shoemaker-Levy 9 crashed into Jupiter in 1994. Their prediction, however, went against the prevailing thought that the impact would be a visual fizzle since it would happen on the planet's far side. Putting money on their prediction, Boslough and Crawford bought 8-in. telescopes and tickets to Hawaii, where Jupiter would be high in the night sky at impact, Boslough recounts in "Impactful Times: Memories of 60 Years of Shock Wave Research at Sandia National Laboratories." His story is among reminiscences by 45 researchers in shock physics, most from Sandia, in the new book by former Sandia researchers James Asay, Lalit Chhabildas, and Jeffery Lawrence and current Sandia researcher Mary Ann Sweeney. Boslough, now retired, and Crawford, who researches computational shock physics, were correct about the plume but didn't see it. "It just wasn't bright enough to see with our little telescopes ... but we saw the remarkable aftermath firsthand as the dark spot from the collapsed plume rotated into our view," Boslough wrote. The cloud plume produced by the impact matched Sandia's computational analysis. "Impactful Times" describes shock physics research at Sandia from its early history to today. Speeding bullets practically stand still compared to impact velocities achieved in shock physics studies, which deal with what solid materials -- condensed matter is the scientific term -- experience when objects collide with them at tremendous velocities, forming a shock that rapidly spreads and can change some of the material to a liquid, gas, or plasma. The interdisciplinary field brings together experiments, code development, and theory to understand what happens to materials subjected to incredible forces. It's used in work on nuclear and conventional weapons, astrophysics, planetary science, material synthesis, and space, among others. Lawrence said the theory developed for high-pressure applications also can analyze what happens at lower shock pressures. The book discusses, for example, Sandia's analysis of a 1989 turret explosion on the USS Iowa that killed 47 sailors. The first half of the 700-page book, released this spring by scientific publisher Springer as an e-book and in hardback, presents Sandia's major research goals and accomplishments in shock compression science over six decades. "We tried to bring out the major technical developments and breakthroughs, including what worked and what didn't, and the torturous paths involved in achieving the final results," Asay said. Among those, he said, were the first gas gun-driven impact launcher, developed in 1958 for precision material property studies and now ubiquitous in shock wave facilities around the world; development of ultra-high velocity impact launchers, including Sandia's Z machine that provides material data at pressures previously achieved in underground nuclear tests; and Sandia's patented quartz gauge, which allowed the first precision measurements of material properties at low pressures. It has been superseded by advanced optical interferometric diagnostics for data at ultra-high pressures. The second half compiles researchers' recollections. The invitation to contribute deliberately refrained from suggesting how to write them. "Some recollections were written as a flow of consciousness, while others were more structured, and some were an annotated list of key publications," Asay said. "Each added important details about shock wave work in different time periods." The title was chosen for the double meaning of impactful, he said. Impact techniques are the principal way to study how materials respond to shock waves. In addition, landmark accomplishments in Sandia's shock wave research had a major impact on scientific and engineering applications and the scientific community. Accomplishments include computer simulations of Shoemaker-Levy 9's impact on Jupiter. Asay and Chhabildas, long-time colleagues who worked in shock physics for decades, said younger researchers often asked them about its history. Questions continued after Asay retired in 2002 and Chhabildas retired in 2007. In 2011, they decided to document Sandia's shock compression science work. 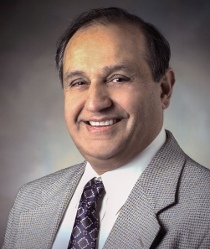 "This was quite a formidable task because shock history at Sandia started as soon as Sandia was born in the early '50s, and we had to research the early years," Chhabildas recalled. They wanted a co-author in the field from earlier times and recruited Lawrence, whose background in shock wave code development and material modeling dated to the 1960s. Sweeney, of Sandia's Pulsed Power Sciences Center, was recruited in 2013 after asking Asay about a shock physics experiment. He gave her a chapter-in-progress, then invited her as a co-author when she voluntarily edited it. As editor-in-chief of the annual National Nuclear Security Administration's Stockpile Stewardship and Management Plan, she brought knowledge and critical editorial skills, he said. Sweeney was surprised by the complications of book publishing. For example, copy editors didn't understand the word fuze, changing it to fuse throughout. She changed it back. "It's not a household fuse," she said. "That was a glaring error for those in the know." 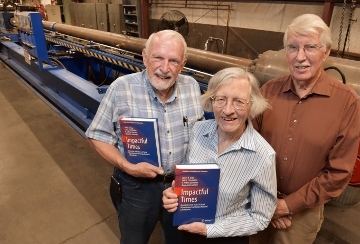 The authors said they hope to inspire experts, non-experts, and early-career material scientists and to interest students of materials science to work at Sandia or its sister national labs, Lawrence Livermore and Los Alamos. They also want to show the public what a researcher experiences -- the challenges, frustrations, personal struggles, and ultimately the gratification of making a pioneering discovery or solving a problem. "The opportunities we had were directly a result of the strong foundations laid out by our predecessors. It is their vision and all the pioneering work they had done that allowed us to proceed and accomplish what we had done," Chhabildas said. "I wish I were 20 years younger because there is so much more relevant shock physics we could still be doing. I think the technology computationally, theoretically, and experimentally in shock physics has advanced so much we can now tackle problems we once could just dream about." "Impactful Times: Memories of 60 Years of Shock Wave Research at Sandia National Laboratories" is available on Amazon.